The 10 Types of Popular Blogs: Which One Is Yours? Whether you’re blogging for big business or to steadily grow your side hustle, settling in on the right strategy is the best way to set yourself up for success. In the same time that it takes you to queue up your Netflix account, you could toss together a blog and begin penning your first post. But what type of blog will you create? And how will you know whether or not it hits the mark? If you’re blogging for business, your blog should not only be an avenue to generate awareness and engagement with your audience, but it should also be one of the primary lead generators for your business. You can easily start generating qualified leads by letting your site visitors submit their email addresses and receive a lead magnet or content upgrade, which are typically free downloadable resources such as a checklist, resource guide, infographic, or ebook. How will the blog help build your business? What will you write about and how? What will you do to keep readers (and search engines) happy and hungry for more? What will a typical post look like? Will your writing be short and uplifting? Thorough and helpful? Long and fascinating? Revealing? Authoritative? The Rogue blog is one that goes against the grain. It exists to break the mold and to stand out from the pack in an effort to attract attention—even, sometimes, negative attention. Because the Rogue blog takes a strong stand on divisive issues, they can be polarizing. But that’s ok because Rogue blogs are founded on the principle that ‘any attention is good attention,’ so while some people will flee from it, others will flock to it. The hope, of course, is that they will generate more admirers than detractors. Rogue blogs are ideal for brands and businesses that don’t mind being a dissident voice and to turn left when the rest of the world turns right. Writing from a counter-culture perspective like requires a fair amount of courage and also conscientiousness. Why? Because it’s possible to tip the scales too far and to alienate more people than you attract. You get to tell everyone what you really think. You polarize, which attracts attention. You’re cool like Indiana Jones. You have to be OK with the fact that not everyone will like what you have to say. This writing style is really tough to pull off without feeling forced. You can’t physically fight your way out of tricky situations like Indiana Jones. The title alone lets you know this post might be a tad controversial. After all, it makes a bold claim and then delivers a curiosity-boosting/against-the-grain statement (“Why I’m Continuing with ‘Dark SEO’”). But it takes more than a clever headline to create a truly Rogue blog. The ‘rogue-ness’ has to run throughout the article and every post you publish. Rather than rattling off a headline and trying to build a post around a catchy idea, first try to identify a topic or perspective that is truly worth going out on a limb for. Otherwise, you risk creating a click-bait style headline that has little to no substance in the article itself. Rogue posts created that way will always fall flat. Truly great Rogue posts have to come from within. They have to be an honest expression of your brand, your business, and the space (or industry) in which you exist. And—they absolutely have to push the envelope. You’ll know you’ve hit the sweet spot because you should feel a little apprehensive about writing it at first. You’ll might be worried about ruffling too many feathers or ‘turning off’ your readers. But if you’re truly a Rogue, you’ll know that for every 1 person you lose, you’ll gain at least 2 who hard-core adore what you have to say and how you say it. Most of the time, the price of being a Rogue is not being loved by the masses, but being massively loved by the few. At the end of the day, remember one thing: you’re being a Rogue in order to rally your tribe and help people. Good Rogue bloggers take stances when they know a stance needs to be taken—not merely for the sake of taking a stance and creating controversy. Passion to prevent your post from sounding forced and manufactured. Knowledge to give you the ability to craft an informed, intelligent argument. Experience to qualify and reinforce your argument. Before investing the time to write a Rogue post, always check for those three ingredients. If you have them, go forth and be Rogue. Rather than slaving away all day to craft excellent articles, certain blogs collect and curate content written by guest bloggers. This type of blog, known as the Guest Host, regularly hosts top-notch writing by articles unassociated with the business. Did you know that Neil Patel grew the KISSmetrics blog to over 400,000 visitors a month by publishing posts that mainly came from guest authors? He also grew the Crazy Egg blog to over 100,000 visitors a month using the same strategy. Although the Guest Host regularly features content from guest authors, the person (or people) behind the blog will also regularly step back into the spotlight and write posts of their own. You don’t have to spend any time creating content. The authors of the post help to promote the article. You can piggyback on the brand awareness of the guest posters you host. Wooing guest posters requires a significant time investment. Your platform needs to already have somewhat of a following to assure guest posters their content will be exposed to a new audience. AppSumo Founder Noah Kagan built his blog at OkDork.com by heavily investing his time in publishing highly-engaging content to attract visitors and eventually attract the interest of other guest writers. As his blog grew, OkDork began accepting articles from outside writers and now Noah has the privilege of accepting articles only from guest who have valuable promotional channels of their own. For example, some of the excellent content chosen by Noah was written by folks at companies like BuzzSumo, ConversionXL, KISSmetrics, and Videofruit. Additionally, Noah also regularly features his own readers who have achieved some type of outstanding result in their businesses as guests. Large audiences or not, what these guests always have in common is that they’ve gained valuable insights from specific techniques they’ve been implementing. And then they teach those techniques to Noah’s readers. Becoming a Guest Host requires a ton of work up front. Why? Because it requires that you already have an established platform in order to attract top-quality guest posters. Once you’ve reached that level, however, building a Guest Host blog is a strategy that can pay off in a major way. If you’re interested in attracting high-quality guest writers to help get your Guest Host blog off the ground, you’re going to have to set some (high) standards right from the get-go. Why be picky when you’re just starting out? Because you have to 1) put your audiences’ needs first and 2) only select authors who value quality and vow to help you promote what you publish. While you work to self-publish articles and grow your audience, you’ll also want to write out some guidelines for your guest blogging program so that you can be sure to receive only the highest quality article submissions. They only feature truly great guest content. They’re looking for in-depth, highly original content. They put their audience’s needs first. They know how to promote the content. Their guests must all know how to promote the content. Place your guest posting guidelines in a prominent place on your blog. Add a submission form or contact email address so potential writers know where to submit their ideas. Put an ad about guest posting for your blog in your sidebar. Link it to the guest posting guidelines. Go to other blogs in your industry and see who is guest posting on them. Create a spreadsheet of all the writers you think would be a good fit for your blog and then email them a personal invitation to write on your blog. Once your platform is big enough, there’s no reason not to fold at least some of the Guest Host into your blogging strategy. Everyone has a friend who is fearless when it comes to trailblazing and trying things first. That’s the Crash-Test Dummy Blog in a nutshell: the trial and error trailblazer who takes action and tests different strategies, techniques, and tools, then shares what works (and what doesn’t) so you can know what to implement and what to avoid. The term ‘Crash-Test Dummy’ was coined by Pat Flynn of SmartPassiveIncome.com. The Crash Test Dummy blog is effectively one giant case study that allows readers to learn from real-world experience rather than waste their time with theory that’s never put into practice. It’s an excellent way to relate to your audience and gain instant credibility and influence—if you’re brave enough to take it on. You’ll stay focused on consistently testing and monitoring different strategies and tools in your business. People are drawn to detailed how-to style articles. You’ll gain new insights into your own business by regularly writing about it. You need to be consistently achieving significant, observable results in your business. You must be comfortable with occasionally chronicling your failures in addition to your successes. Sometimes the strategies you reveal could potentially help your competitors. Pat has mastered the art of the Crash Test Dummy post—each post is hyper-relevant to his audience’s needs and teaches them high-value strategies they can immediately apply to their businesses. There were successes. There were failures. There was a key lesson. And that’s exactly what a Crash Test Dummy post should contain. Most bad Crash Test Dummy posts either try to teach without providing actual results they achieved themselves, or they provide all the results but do a poor job actually teaching their readers how to get those results as well. Great Crash Test Dummy posts take months (or at least weeks) to create. Why? Because it’s more than a writing exercise, it’s a process of testing out your hypothesis on your own business and sifting through the results so that you can report back something meaningful to your readers. You also have to give whatever strategy/tool/technique you’re testing enough time to produce observable results from which you can draw solid conclusions. You then need to go into exhaustive detail (while also holding your readers’ attention) as you explain the process in your post and teach readers how they can set up something similar. To write this kind of post, ask yourself questions like. . .
What strategy/technique/tool have I recently tried out in my business? What kind of results did I see? What actions did those results cause me to take? How does this information apply to my audience? Haven’t tested anything out in your business lately? Now’s the best time to start. Rather than focusing on broad topics like leadership, marketing, or sales, niche blogs get hyper-specific. When Pat Flynn began his Niche Site Duel (in which he and Tyrone Shum each created niche sites from scratch), his list of potential niche ideas included things like writer’s block, police training, and data loss—that’s how specific. The premise of Stephanie Le’s food blog is simple: she posts recipes you can make at home and pairs them with pro-quality photography (and sometimes an interesting anecdote). But it’s the quality of content that makes Stephanie’s blog such a great example of an outstanding niche blog. Stephanie’s blog does what so many of her competitors within the niche don’t do: it features drool-worthy pictures, a clean, minimalistic layout, a simply formatted recipe, and good writing punctuated by relatable stories. What can I do better than everyone else with some extra time and effort? What are the real audience needs that everyone else is ignoring? What’s working for others that could work for me? These are the key questions to ask to dominate your niche, and I’m betting that Stephanie Le asked herself all of them at some point. The nature of niche blogs means that a quintessential niche post could vary dramatically depending on the niche. Regardless, the one overarching principle with niche blogs is this: just because you have a narrow topic doesn’t mean you should have a narrow mind. This is still relevant to your niche (it shows your readers how to increase the value of their listings), but it also hits on that newly discovered area of interest: DIY home upgrades. Carefully and consistently monitoring your readers’ interests will keep your content fresh, yourself engaged, and your audience delighted. The Giver gives away incredible free bonus content with every post. These are called “content upgrades” — an additional piece of content created for a specific blog post and given away in exchange for an email address. On top of being a great way to deliver more value to your audience, they’re also a great way to build your email list. You can collect more email opt-ins per blog post than ever before. You can deliver even more value to your audience. It makes you better at content creation. It takes additional time to create an additional unique piece of content for every blog post. Today, content upgrades are used heavily by sophisticated bloggers, but one of the early adopters of this winning strategy was Bryan Harris at Videofruit. He’s given away everything from bonus videos to PDF walkthroughs to free coaching sessions. Typically, he’ll include an eye-catching call-to-action to download the content upgrade both the beginning and end of his posts. The call-to-action area links to a LeadBox that allows you to opt-in for the content upgrade. He regularly experiences conversion rates of 20-30% (and sometimes as high as 62%) with these LeadBoxes. This LeadBox delivers a content upgrade containing Bryan’s pop-up swipe file. Bryan has embraced the Giver strategy wholeheartedly and it’s part of the reason why his blog has experienced so much growth (in addition to a lot of hard work). The key to nailing a Giver post is in giving away a content upgrade that is relevant to the specific post you’ve created. Here’s what usually happens: you write a blog and then offer the same downloadable piece of content in exchange for an email address that you offer at the end of every other post on your site. Since you write about different things, that post of content isn’t always going to be relevant to new visitors who come to your site to read a specific post. The Giver creates a new lead magnet that is relevant to each specific post. For example, in a case study on the Leadpages blog entitled Namastream’s Novel Approach to (Artisanal) Digital Marketing, Jennifer Barcelos of Namastream gave number of excellent examples of how she infuses her digital marketing and lead generation with a personal touch. So, to complement her case study and to offer our readers another valuable resource, we compiled a list of the top 10 ways to craft artisanal digital marketing as a PDF for download. The Guide writes posts that help readers with their personal lives. Many bloggers utilizing this blog type discuss topics like personal development, life coaching, and/or spirituality. Establish deeply personal connections with your readers. Experience personal growth through your own writing. Guiding others to significantly improved personal lives is fulfilling on a deep level. You can easily be lumped into the overly populated, distrusted category of personal growth/ self-help. Dealing with sensitive topics requires a more delicate touch than most other blog types will demand. Zen Habits isn’t just one of the most popular Guide blogs — with over a million readers, it’s one of the most popular blogs out there, period. There are a variety of lessons it can teach us about building a popular Guide blog, but chief among them is the importance of finding the right writing style. At ZenHabits, Leo’s posts exhibit a writing style that is calming, profound, and wise. Learning how to make your readers associate those words and feelings with your writing isn’t something you can do overnight. As Leo himself says, it takes time and lots of practice. However, let’s take a look at a few of the ingredients that make Leo’s posts so effective. The best Guide posts are those that attempt to simplify semi-complex concepts that can take people years to learn and deconstruct complicated issues into smaller, actionable steps. These posts speak directly to pain points readers may have struggled with for years, such as concepts like anger, lack of confidence, personal fulfilment, etc. One of the main reasons Leo is able to teach such complex lessons in such digestible doses is because he often gives readers a way to take action immediately after reading the article (often by utilizing lead magnets and content upgrade offers). For example, in “How to Believe in Yourself” he leaves readers with a checklist of actions readers can take to increase their self-confidence. In “Pursuing Happiness When It’s Already Within You” he gives readers a simple mental exercise that it’s necessary to continue pursuing something you already have. This style of blog post can often deal with sensitive subjects and it’s important to never talk down to readers or act like you’re above the problem you’re attempting to help them solve. An effective Guide post displays a masterful understanding of empathy. In both of the Zen Habits examples I mentioned previously, Leo mentioned his own journey toward the results the posts were designed to teach. Although honesty and transparency are always important regardless of the blog type, they’re of paramount importance to the Guide. Effective Guide blogs don’t promise or try to give all the answers. Instead, they help facilitate conversations readers need to have with themselves. They guide readers to their own personal “Aha” moments. It’s easier said than done, but (like Leo says) it can be accomplished with time and lots of practice. Much like the renowned Iliad, the Homer blog title is reserved for bloggers who write posts of epic proportions — posts that take readers on a 2,500+ word journey every time. Though word count is one of the most noticeable aspects of the Homer, the word count is simply a means to an end, and that end is a transformative journey. The Homer takes the reader from Point A to a vastly different Point B. 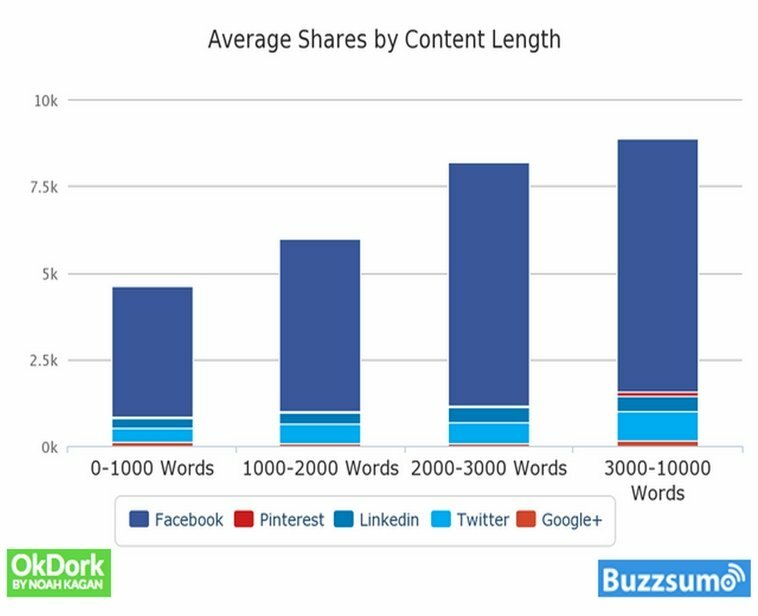 According to BuzzSumo’s analysis of over 100 million articles, long-form content gets shared more than short form content. Greater word count gives you a better shot at attracting organic search traffic. Each post is a major time investment and usually requires more research. Your writing must be even more compelling than usual in order to hold readers’ attention longer. Typically, a lack of response/shares of a 2,500+ word blog post is more crushing than a lack of response/shares on a short post. Johnny B. Truant once wrote a post so epic he was able to turn it into a short ebook and sell it on Amazon. It was called “The Universe Doesn’t Give a Flying **** About You” (Warning: as you likely can tell by the censored title, this post contains a fair bit of NSFW language). This post clocked in at just under 3,000 words, was shared over 7,000 times on Facebook, and shows why Johnny fits “The Homer” to a T: he doesn’t just write a bunch of words to fill up space, he writes a bunch of words to radically shift your thinking. He takes you from Point A (It’s too scary to take risks and try to do something awesome with my life) to Point B (Wow, my life is actually pretty insignificant, so why not do something awesome with it?) in the span of a few thousand words. Part one of mastering this type of blog post is getting the length right. One of the key insights from the aforementioned BuzzSumo study was that 2,000-3,000-word articles (in the top 10% of most-shared articles) averaged over 7,500 shares, a significant increase from the ~6,000 share average of articles in the 1,000-2,000-word range, and an even bigger increase from articles in the 0-1,000-word range (~4,750 shares). However, when articles rose to the 3,000-10,000-word range, the average share amount barely increased. Just take a look at the original graph below. The moral of the story? Shoot for 2,000-3,000 words, as the share payoff begins to diminish after that threshold. Would you be comfortable swapping stories with the Most Interesting Man in the World from the Dos Equis commercials? Have you been to the top of the mountain… and also walked through the shadow of the valley of death? Have you learned a lot of valuable information the hard way? If you answered “yes” to all three of those questions, the Tell-All might be the perfect fit for you. To put it simply, the Tell-All blog frequently writes posts that feature both shockingly revealing details and highly valuable information/lessons learned. You get to put the most compelling stories you’ve lived onto paper. You can put a lot of personality into your writing. It’s great for building a personal brand. Crazy experiences are a prerequisite. It’s a difficult writing style to pull off. Generally, more creativity and narrative ability are required than many other kinds of blogs. These are all compelling details that helped move their respective posts forward, while also keeping things interesting. They’re not there simply to feed James’ ego or need for attention. The second example is part of a larger story that shows his readers how to deal with haters, and the third is part of a larger story that helps his readers understand how to be a great interviewer. James has lived through enough compelling experiences (that yielded valuable lessons for his audience) to necessitate a Tell-All blog. He’s gone from millionaire to 100% broke more than once. He’s written over 10 books, some which completely flopped and some that became bestsellers. He’s a husband and a father to two daughters. He has a knack for illuminating the valuable nuggets in the wild, revealing stories he tells — and that’s exactly what makes his audience love him so much. The Tell-All has much in common with the Rogue. They both reveal surprising details that illuminate a larger lesson or problem. But while the Rogue is concerned with revealing external details, the Tell-All reveals internal details. The quintessential Tell-All post centers around a compelling narrative that reveals a valuable lesson that’s relevant to the audience. To put it simply, it tells a juicy story that teaches your audience something. Important: just like the Rogue isn’t controversial for the sake of controversy, the Tell-All isn’t juicy for the sake of juiciness. It doesn’t matter that you had just negotiated a million-dollar deal unless that detail is relevant to the story in some way. If you’re asking yourself whether or not you have crazy enough stories to necessitate a Tell-All blog, the answer is “no.” If you did, you wouldn’t need to ask yourself. Are you a major part of the brand you’re trying to build? Well, of course, you are. You’re building it, after all. But is your personality a cornerstone of the blog you’re building? Is your name in the URL? Is your face all over the home page? Do you want to be known as you, or as the person who writes Blog XYZ? In a sense, any type of successful blog will help build your personal brand. The Personal Brand blog, however, makes that result the top priority. It’s ideal for positioning yourself as a speaker/thought leader. It can increase your name recognition within your industry. You need to be comfortable putting yourself in the spotlight. You have to treat yourself like a product, which is a unique challenge that requires brutal self-honesty. Marie Forleo has one of the strongest personal brands at the intersection of personal and professional development, and her success is rooted in the strength of her blog at MarieForleo.com. People don’t buy into Marie just because they love her content (which is, in fact, excellent in its own right) — they also buy into her because they love her personality. As you can see below, visuals can go a long way in helping establish your personal brand. Don’t be afraid to show your face and use “I / Me” language. The banner and navigation bar on the MarieForleo.com homepage are designed to reinforce Marie’s personal brand, in addition to letting visitors know exactly what Marie will help them accomplish. I also wanted to feature Marie to illustrate an alternative blogging format to those who prefer not to write — video. Although Marie has great written content, her bread and butter have always been “MarieTV,” a video series consisting of helpful how-tos, interviews, and more. The YouTube channel she created for the series is wildly popular and always growing. It allows visitors to see more of you. It forces you to become better at speaking and communicating in front of an audience. Regardless of format, the key aspect of the Personal Brand blog is in the name — it needs to have personality. This doesn’t mean you need to be in-your-face, and it also doesn’t mean the posts have to be all about you. It just means your posts should be framed with your personal views and qualified by your own experiences. To accomplish this, try writing posts that detail things like. . . These topics can not only further your position as a thought leader in your industry, they can endear you to your readers. The Enterprise is a blog built for a company, not an individual. It’s the type of blog companies like Buffer, HubSpot, and Coca-Cola feature on their websites. Typically, a team of writers create content that is relevant and valuable to the type of people who fit the company’s customer profile. That content then attracts those potential customers to the website, where they can learn more about the company’s product(s). It’s a key ingredient to an effective content marketing strategy for your company. A great Enterprise blog can dramatically impact your company’s revenue. You can feature a variety of writers and voices. You have to take the time to find great writers you can trust with the brand you’ve worked so hard to build. This is what we strive for on the Leadpages blog — content that’s 100% valuable on its own (both to customers and non-customers) and also further qualifies visitors as leads. Since our lead generation software and landing page builder has processed well over 20 million leads, we’re able to see what’s currently working in conversion optimization and bake those insights into content that’s relevant to potential prospects. Roundup Posts – These feature our favorite landing pages and Leadboxes customers have created. They’re designed to both inspire existing customers and to show prospects what our software is capable of. Long-Form Posts – Like the post you’re currently reading, these aim to provide pure value in order to attract prospects. Podcast Episodes – ConversionCast, provides conversion optimization insights through interviews with other businesses. Customer Case Studies – These show how a customer achieved a desirable result using Leadpages. Like roundup posts, these further educate customers while showing prospects the kind of results you can achieve with Leadpages. Free Landing Page Templates – We regularly give away free landing page templates and pair the giveaway with an educational video walkthrough that shows prospects how to use it and why it works well. LeadPages Feature Updates – All major feature updates and launches are also chronicled on the blog. As you can see, the Enterprise blog exists both to attract new leads and provide valuable content to existing customers. It’s both an acquisition tool and a retention tool. A truly great Enterprise post not only attracts prospects with interesting, high-value content, it also converts them into customers. If you have a great product that’s relevant to the needs of your readers, you can do this without hitting the prospects over the head with a sales pitch. A mention of a product here, an interesting result a customer achieved with your product there, and your content can start generating more sales. Use data from your business to provide unique insights others in your space can’t offer. Detail specific strategies you’ve learned from testing them in your business. Take a stand on something people have different opinions about and share how your company arrived at that stance. Consider each Enterprise post an opportunity to attract prospects, delight your customers, and add to your business’s authority. In all likelihood, your blog contains (or will contain) certain elements of more than one of the 10 types profiled in this post—and that’s usually the case. While OkDork.com is a great Guest Host example, it’s also a good Homer example. There’s probably a bit of Crash-Test Dummy, Tell-All, and Rogue in there as well. However, each blog typically has a dominant type of post and it’s important that yours does too, otherwise it may be a sign that you still have some work to be. done around clarifying your vision or business goals. Now it’s your turn, which blog type do you think is the best fit for you, and why? If you have experience blogging, have you had success with any of these types of blogs before?